MoovJla can be used with Joomla! 1.5, Joomla! 1.6, Joomla! 1.7, Joomla! 2.5, Joomla! 3.0 AND Joomla! 3.x. It is based on MoovlaJ15 (specific to Joomla! 1.5), itself derived from Moovla, created by "globule" for Joomla! 1.0. Thanks to "globule" and "drf14" for providing the original files and for their help. Important : MoovJla needs PHP 5 on server. Pleas always use the last version! 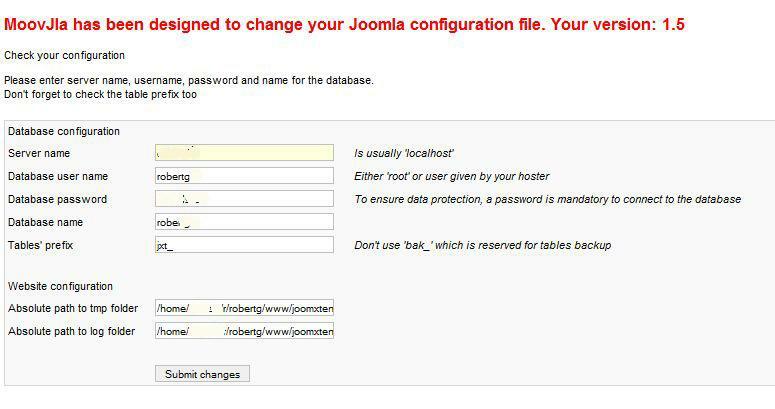 MoovJla is designed to update the configuration.php file when moving a Joomla! website from a server to another. It automatically fills the fields for the logs and tmp folders, which only leaves you to fill the fields for the database configuration. Unzip and upload on your site root, then type your site address and complete with "MoovJla.php" - for example : http://www.mywebsite.tld/MoovJla.php. JoomXtensions.com is not affiliated with or endorsed by the Joomla! Project or Open Source Matters.